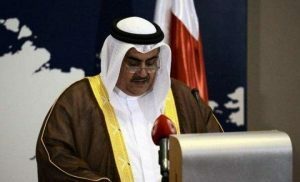 Bahraini foreign minister Monday stopped short of naming Turkey as he assaulted Qatar for military escalation in the crisis – an indirect reference to Turkey’s current military capacity building in Qatar. “The foundation of the dispute with Qatar is diplomatic and security-oriented, never military,” Sheikh Khalid bin Ahmed Al-Khalifa said on twitter. “Bringing in foreign armies and their armored vehicles is the military escalation that Qatar has created,” he added. Bahrain, Saudi Arabia, United Arab Emirates (UAE) and Egypt have cut ties with Qatar on terrorism funding charges. The bloc has also besieged the tiny emirate closing their sea, air and land borders with Qatar. Iran and Turkey took advantage of the blockades to upgrade ties with the isolated country. Ankara has started deployment of soldiers to Doha, arguing the move takes place under an agreement signed in 2014. Around 100 troops were positioned in the Turkish military base opened in Qatar last year. Last Thursday, five armored vehicles and 23 military service members arrived in Doha after the Turkish parliament approved the decision to increase their presence. Turkey is planning the deployment of 1,000 troops to take part in military drills with their Qatari counterparts. Sheikh Khalid bin Ahmed Al-Khalifa’s comments followed demands by the Saudi-led bloc asking Qatar to suspend military cooperation with Turkey; one of the 13 conditions set by the group before lifting the blockades. Turkey and Iran have rejected the accusations against Doha and have called for dialogue to end the crisis. Iranian president Hassan Rouhani voiced his support for Qatar, saying “the siege of Qatar is unacceptable to us”. Doha is accused of supporting and funding terrorist groups in the region thereby contributing to the destabilization of neighboring countries. Qatar is also accused of swerving from the common stand of the Gulf Cooperation Council against Iran. Written by: KanelkaTagba on June 27, 2017. Posted by KanelkaTagba on Jun 27 2017. Filed under Gulf News, Headlines. You can follow any responses to this entry through the RSS 2.0. Both comments and pings are currently closed.